Tactical Solidier is a really great turn based strategy game that basically does everything right. 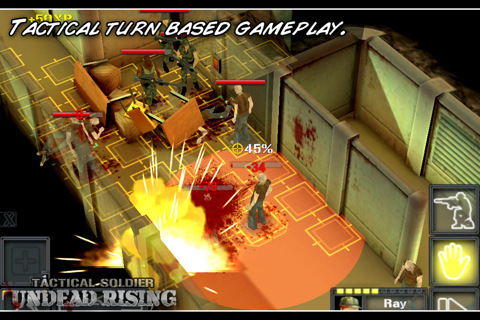 You take command of a small group of soldiers that are trying to figure out why their base is being overtaken by zombies. You start off with a single character and as you explore the base other soldiers will join your group. The controls, graphics, and sounds are all perfect. Also, did I mention this is a universal application? The game uses an AP system for turns that works great and the enemy encounters are something that I looked forward to each time. You will find weapons, ammo, keys, med kits, grenades, and more by searching dead bodies. The boss fights are particularly fun and challenging. You earn experience points by defeating enemies and earn skill points each time you finish a level. You can use these skill points on 8 different skills on anyone in your group. The game tells the story bit-by-bit using comic book type cut scenes that really fit nicely into the theme and art style of this game. The description says there is 7+ hours of gameplay and I believe it as I’m only about 1/2 through the game. This is a great game and one of the better that I have played in some time. I would highly recommend this game as it is a lot of fun and bang for your buck.